If you’ve been in Christian circles long enough, you know there’s a word that is certain to stir up mixed feelings, wild emotions, opposing points of views, and general frustration. There are some who try to live by the intent of the word, and there are others who immediately put up a wall when you mention the word. I want to look at that word, but maybe from a different level. But give me a fair chance, please – don’t just close the post when you read the word, okay? Even though I know how divisive this word is, I want to share about it from my own perspective. You’re welcome to agree, disagree, comment with your feelings, but I’d like you to hear what I have to say. So here’s the honest truth: On any given day, I don’t want to consider submitting to my husband. Given all that has happened in my life, I’d like to just continue going through our mess, simply trying to get to the other side. But God keeps placing this word – one that divides even within the church – onto my heart. The point of this image is that a husband and wife draw closer to one another as they draw closer to God. What has happened in my marriage is that we’ve struggled with selfishness, with our own desires. This has done the exact opposite of drawing us closer to each other. It’s pulled us away from each other and away from God. Over the past couple of years, as we’ve intentionally tried to get our relationship and marriage right with each other and the Lord, we’re starting to look a little more like this triangle. My husband has worked hard to correct issues in his past and is working hard to be the leader in our home. Which brings me back to needing to look at the word submission. How do you submit to another person, particularly your husband, especially when things have gone badly? If I want to do what God’s calling me to do, I need to remember that the situations I find myself in are an opportunity to honor Him. When my husband and I are having a discussion and God whispers, “You need to submit,” it’s often God’s gentle way of trying to draw my own heart closer to His (God’s) heart. God is trying to get me in line, and at the same time, He’s working in my husband’s heart to continue to learn to lead our family. I don’t view submission as my husband ruling over me, lording his power over our marriage. My husband doesn’t treat his role as the leader in that manner either. Rather, we both view the concept of submission as getting our hearts in line with the Lord, and letting Him gently lead us and grow our relationship as He desires. For me, the concept of submission – even when I really don’t want to – means that I’m choosing to honor God first and foremost, by following His instruction to follow my husband. So how do I get my heart to want to submit, especially when my husband has not always been the best leader and has let me down in some pretty big ways? 1. Get Alone With God. I say “get alone” because time alone with God in this kind of situation almost always requires an intentional choice on my part. Often these opportunities to submit don’t come at the most convenient times. They often arise at chaotic times when I have a lot going on, so I need to intentionally choose to get alone with God. These are times when I share my heart with the Lord. I tell Him my feelings, the situation from my perspective, and then I try to listen. The Lord loves to hear from us, but He loves when we listen as well. Struggling? Make time to get alone with the Lord, talk to Him and listen to what He says. No, I’m not going to suggest you read the passages on wives submitting to their husbands. Not at all. Instead, I’d rather encourage you to go to your favorite passages, your “go-to” verses for when you need reminders of God’s faithfulness. You see, God’s giving us another opportunity to trust Him, and if you’re at all like me, you need the reminder that He is faithful – no matter what – more than you need the reminder to submit to your husband. 3. Remember That No One Is Perfect. Oh yes – this one. There are times when my husband will suggest something, or let me know what we’re going to do. Our fridge started making some noise. He started at step one – identify the problem – and worked up to calling the company and scheduling a technician to come out to check the fridge. Unfortunately, things don’t always work out the way my husband plans, and I hesitate to go with his plans. But – how am I going to see God’s faithfulness (step #2) if I keep getting in the way? If I’m going to ask God to remind me of His faithfulness, then I need to let God work, right? I need to get myself and my ideas, my preconceived notions of how things will go, out of the way. How bad would it be if my husband was wrong about how he handled the situation? Am I willing to give up my own “need to be right” to let my husband lead? He’s not perfect, he may in fact be wrong. But I’m not perfect either. In fact, I’m often wrong. It’s important for me to keep in mind that while God is working in my heart, He’s also working in my husband’s heart. When I am wrong, my husband is so gracious and gentle, and I need to treat him with the same respect that he freely gives to me. I think we often get hung up on submission as us being less than, not as important as, our husband. Friends, nothing is farther from the truth. God hasn’t asked us to submit because our husbands are better than us, or more important than us. I believe He asks us, as the brides, to submit to our husbands so that our heart can grow to learn to submit to Christ – the bridegroom of the church. I would love to hear your thoughts and encouragement on this topic. Feel free to comment here at Jen’s blog, or hop over to my blog and leave your thoughts as well. Rebekah has been completely overwhelmed by the grace and mercy of the Lord in her life. He has proven His faithfulness in every area of her life, especially in her marriage. 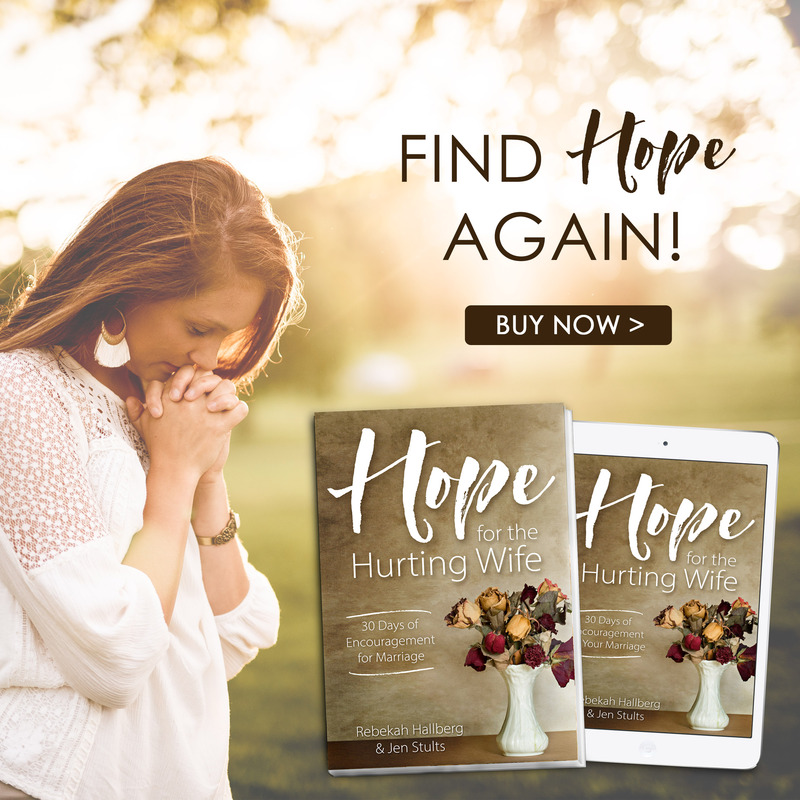 She has come to understand the power of redemption and God’s work in her own marriage. Her goal is to be Sharing Redemption’s Stories – encouraging wives who are praying for redemption in their marriage. It’s one of those frustrating days when everything seems to go wrong – one thing after another. Yeah, that kind of day. Tears threaten to spill over any moment because I can’t just can’t seem to keep on the right path this week. Discouragement has been my constant companion. I think yes, this is what I feel like – a soldier – a weary, weary soldier. It’s the refrain of my life lately and likely the refrain of your life, too, since the Word claims that our battle is real! We fight against more than flesh and blood; we fight against the very forces of evil. We fight against our own sin nature, too! That fight can drain a person. 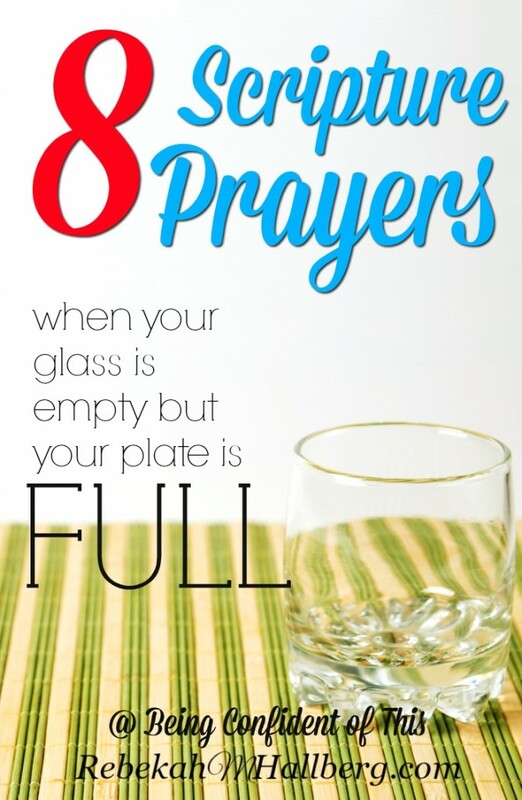 That fight often leaves a person with a glass that is empty, but a plate still full of responsibilities. Most days, I’m thankful for the power of Christ in me to “keep walkin’.” But some days I desperately want rest. In fact, every few days I throw one of those adult mind-fits – you know, the kind of temper tantrum you can’t see on the outside, but boy, is it brewing on the inside! 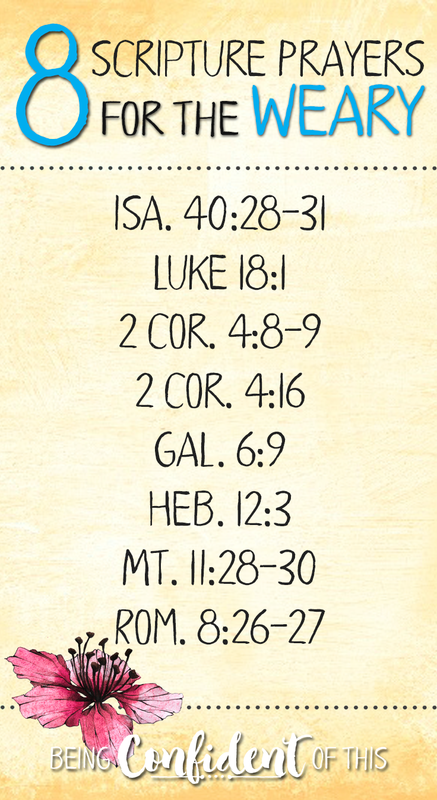 If you find yourself in a season of life that requires much of you, friend, cling to these scriptures below. Pray them at every opportunity so that you can keep walkin’! And to him who lacks might He increases power. Father God, I feel so weary lately, as if I have nothing left to give. 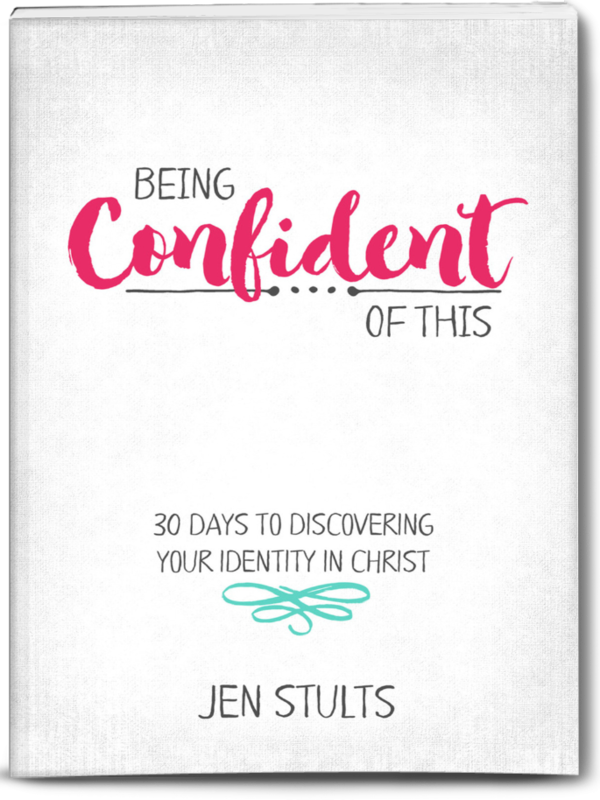 But I know that the enemy’s favorite phrase for me is “you can’t.” Help me to combat that lie with the truth that I already have all of the strength I need in You. You are the Everlasting God who never grows tired or weary. You give strength to all who need it! Help me to wait on you alone, Lord, so that I can mount up with wings like eagles. To continue reading, join me over at Sharing Redemption’s Stories! 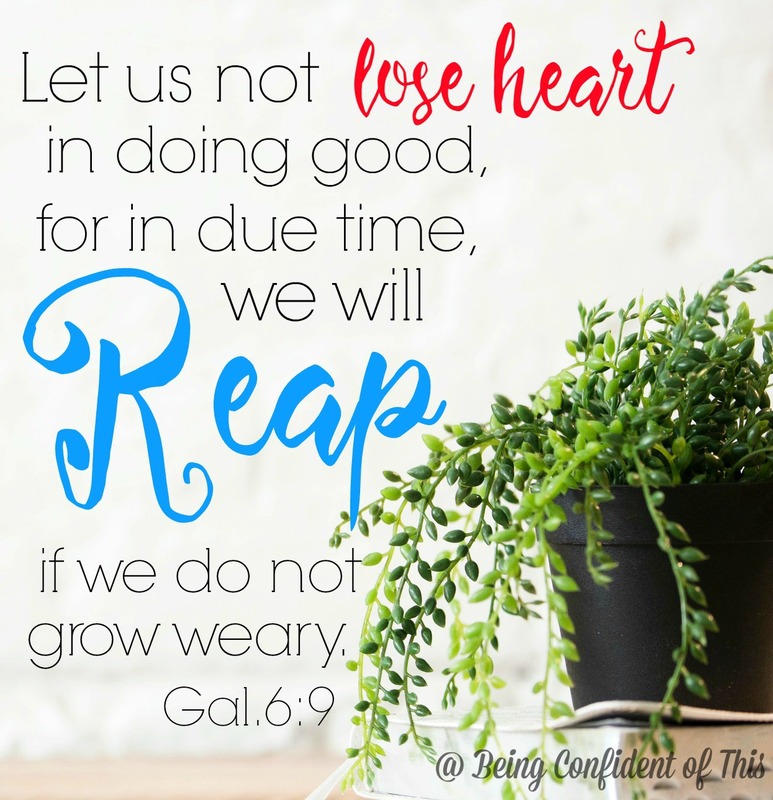 A few weeks ago I posted the verse below from Galatians 6:9 about not growing weary of doing good, which has become my anchor in this season of busy schedules and church planting challenges. It’s perfect for this season because it easily applies to every area of my life in which I desire to remain steadfast. Do not grow weary of setting aside time to abide in the Vine. Do not grow weary of loving and listening to my husband. Do not grow weary of training up my children. Do not grow weary of being a good friend and neighbor. Do not grow weary of keeping my home tidy. Do not grow weary of eating healthy and exercising even when….maybe especially when… the scale doesn’t budge. The list could extend for pages, really. So, I posted this verse on the blog facebook page and after seeing it there a few times, kind of forgot about it. And wouldn’t you know that after weeks of not having a single new visitor (and very few actual attendees), we had not one… not two… but three unexpected guests last Sunday! In fact, one couple has been invited nearly every week by my persistent husband since the church plant opened way back during Easter. There’s more. After prayer walking that same Sunday afternoon, we had almost a dozen extra visitors during our bread ministry that week and actually ran out of bread! Here’s the thing: Sometimes we’ve prayed for something so fervently, and for so long, that we quit waiting expectantly. And then when the answer comes, when the need is met, we fail to recognize the significance. As a daughter of the Most High, I often grow childishly impatient. I want an answer right now. I want clarity. I want an inkling of the Father’s plan. I want some sort of tangible evidence that we are on the right path. If I’m honest, I want miracles. And this is where I can most relate to Peter, who asked to walk on water with Jesus and then stumbled, nearly drowning in his own doubt. I’m sure that first step was a mountaintop experience, a spiritual high like none other. I’m sure Peter was elated, soaring on faith-wings that yearned to stretch wider and swoop higher! Yes, I’m doing it. I’m doing it! I’m equally certain that the floundering steps that followed were terrifying. Maybe it felt like too big of a leap of faith. Maybe the wind and waves increased in size and ferocity. For whatever reason, his confidence wavered. Wait, am I really doing this? What if I can’t keep it up? What if my faith is too small? What right did Peter have to walk on water in the first place? Who was he to make such a bold request? Yet in the eyes of Jesus, he was worth an abundant amount of time, effort, and instruction. He was worth forgiving even as he was busy betraying. And before Jesus left this earth, He claimed His Church would be built upon Peter. Imperfect Peter with the imperfect faith (Mt. 16:18). 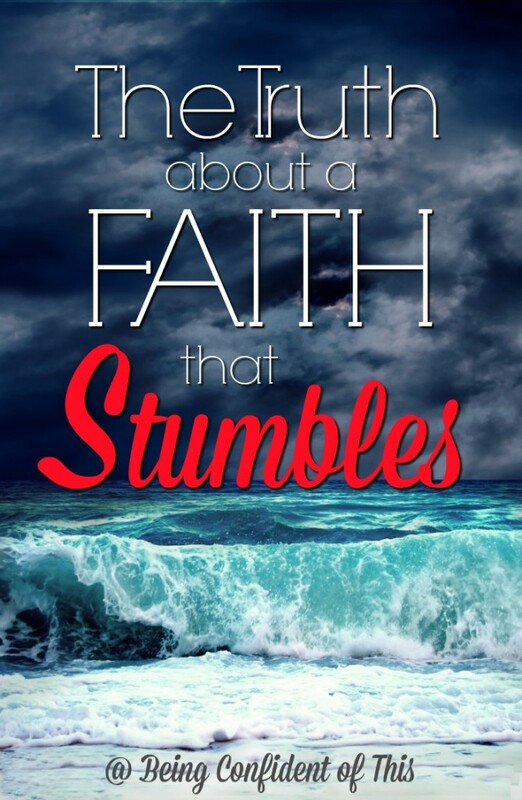 You see, friends, we need a faith that leaps – yes, we do, but we also need a faith that stumbles on water. We need that sudden sinking, that floundering fear that drives us straight into the arms of our Savior. Because when we are weak, then we are strong (2 Cor. 12:10). It’s when we begin to think that we can do it on our own, when that smidgen of self-righteousness and self-sufficiency sneaks its way in, that we should truly be frightened. That truth has never been more clear to me than these last few years of struggle. Friends, if I only talked about the faith that leaps, I’d be remiss. I’d be painting only half of the picture. The truth is that these last few months have been full of walking-on-water moments followed by sudden sinking and ultimately a return to the truth that trumps all others – we need Him. We need our Father God. We cannot do it alone as much as our perfectionism preaches to us that we can, for even our very faith comes from the Lord and not ourselves (Eph.2:8-9). We need to keep believing that He will “show up” for us. We need to keep waiting expectantly. We need to look for the work-in-progress He is completing in us. So, if you’ve had some of those moments of stumbling on the water lately, take heart and look to Jesus just as Peter did.